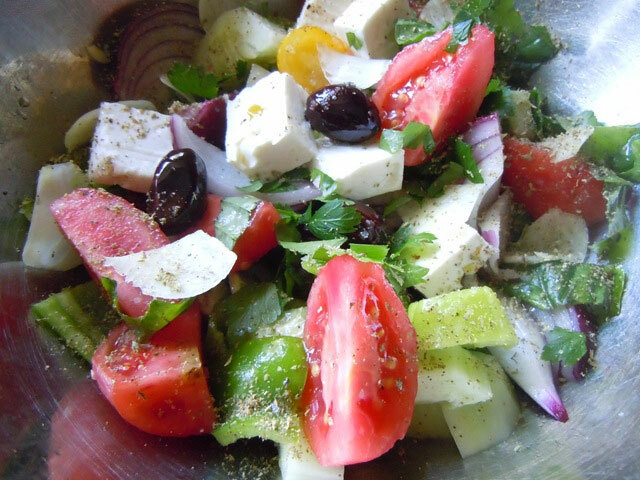 This is a classic Greek Salad in which we've maintained the Greek tradition of Kalamata olives and crunchy peppers, and added a generous amount of Lykovouno and colorful farmer's market flair. Serves 4 to 6. Wash and dry your vegetables. Boil the beets in water for 15 minutes or until just slightly soft. Slice the tomatoes, onions, and beets into wedges. Slice the cucumbers into thin rounds and peppers into thin rounds. Sprinkle the ingredients with the juice of one lemon and toss with Lykovouno Olive Oil. Add oregano, salt, and pepper to taste. Serve with crumbled feta.